Chicago (population: 2.8 million) is located on the shores of Lake Michigan, and is the third largest city in the United States. Various interstate, state, & US highways travel thru the "Windy City" along with several railroad carriers. O'Hare International Airport is one of the busiest terminals in the world, and handles a great deal of air traffic on a daily basis. The Chicago and Des Plaines Rivers still provide an outlet for water traffic if chosen by those wish to travel by that mode. "The City of Big Shoulders" was founded in 1803 as Fort Dearborn, then grew slowly until it was recognized as a city in 1837. Although it may have suffered a setback in 1871 to the Great Chicago Fire, the city pulled itself up by its own bootstraps to rebuild, gaining many immigrants from various European countries and hosted the Columbian Exposition in 1893. By then, Chicago had grown even more to the point that it became the fastest growing city in the US during the second half of the 19th Century. St. George School for Girls was opened in 1918 by its founder, George Williams. The school’s purpose was to educate at the elementary level and do so by having a facility that embraced the heritage of the Hyde Park neighborhood. The school expanded to a high school division and eventually took in boarders around World War II, when about 300 students lived on campus. 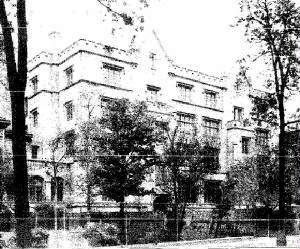 St. George was initially located at 910 Lawerance Avenue on the city’s North Side, but moved in 1921 to 4545 Drexel because of increased enrollment. The high school opened at that time, but it became too large to handle and returned to an elementary school in 1938, according to the archives of the Hyde Park Herald. In 1934, Anne Tyskling arrived at the school as a teacher, and assumed the director’s role two years later to guide the future of the school. After closing the high school down and getting thru World War II, St. George went thru a period of consternation which included having to move the school, financial crisis, and the threat of closing the school. Mrs. Tyskling did what she could to keep the school open, including having to move to the Rodfei Zedek Temple on East 54th Place. Another hallmark moment that St. George endured was in 1952 when the school was threatened with eviction due to admitting a Hindu child into the school. 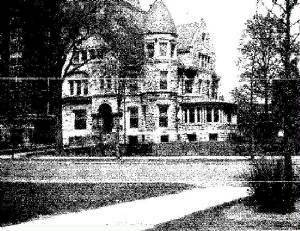 For those who lived around the school, the child was thought to be African-American as the city of Chicago was experiencing an influx of people from the southern part of the United States, and since the school was located in a neighborhood where the neighbors objected nor cared, St. George rose above the situation by becoming a model to other schools in how they accepted all children, regardless of their race, creed, and color. St. George's certainly must have have offered some extra-curricular activities to its' students while it was opened as a girls' school, but there was no information available at the time this page was written. We are looking for more details, and welcome them at the addresses listed below. "My twin sister and I were first grade students at St. George in 1932. We were the youngest girls there at that time. If my memory is correct, the lady in charge was Mrs. Edgerton. We called her Mama Edgerton. I remember our uniforms were gray, long sleeves with white cuffs and collar. The lower grades had blue ties tied with square knots, the upper grades had red ties. "I also remember singing the school song as were going down stairs for meals. "Hail, Hail to St. George School" are the only words I recall. I am trying to write my life history and wish to include pictures. I am hoping you will be so very kind and e-mail me a picture of that beautiful building (email address is gerriurban@att.net)and I thank you in advance." "I went to this school in the 50's. You said you wanted to know about any activities they had. Mrs. Tyskling had us riding horses at the South Shore Country Club. We were in small shows but her son always won the prize."